Top has die-stamped beaded openings measuring 12 3/32" x 20 3/32"
A poly cutting board, 8" wide x 1/2" thick, is mounted on stainless steel brackets located on control side of unit. Legs are 1 5/8 O.D. stainless steel tubing fitted with adjustable non-marking plastic feet. Indicator light remain on continuously while control is on. Each heat compartment is 8" deep and lined with 22 gauge galvanized steel. Each compartment is insulated on all four sides and bottom with 1" thick fiberglass or equal. All units are single phase. Three-phase wiring available. • 22 gauge stainless steel construction complete with recessed stainless steel handle. 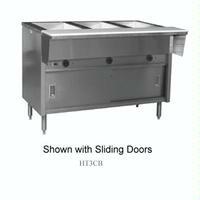 • Doors sit within an exclusive rollerless track assembly, providing easier cleaning and lower maintenance.